We are a local family owned and operated business. 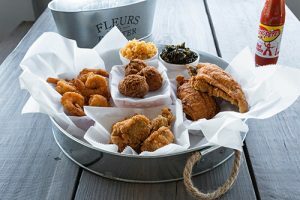 We started our business in our very own backyard selling fish fry plates on 4th of July and together, as a family, we grew our 1st store front. Fast forward 7 years and we are still together, as a family, starting our second. Our passion is providing the freshest quality, local ingredients cooked to order with love. Everything we make is homemade with love. this is a place where everyone becomes family. Although our motto is, “Fresh, Fried, & From the Heart,” we can accommodate any diet. We serve everything from your favorite fried and down home comfort foods to steamed, heart healthy options.